The 5th March saw the first of 5 football tournaments that will be taking place weekly. First up were our Reception and Year 1 pupils, and then our Year 2's. All the children taking part have had great fun. On 26th March our Year 5 girls played their tournament as a Federation team. They all played brilliantly with true team spirit and we came a fabulous 3rd! We will add more photos for you to look at as the tournament continues. These three running superstars took part in the West Yorkshire School Games Cross Country at Temple Newsome, Leeds on Wednesday and all three gave a brilliant performance. In the Year 4 race there were 157 children competing. Evan came 12th and Felix came 16th! There were 154 children in the Year 3 race and Sam came 8th! There were 5 districts taking part so there were about 30 children from each district. Out of the Kirklees runners, Evan came 2nd and Felix came 3rd in their race, and Sam came 2nd in his! Absolutely excellent performances form these boys. Bring on Neilley races! Some of our pupils took part in a sporting event at Shelley College on Tuesday afternoon and proved what Sporting Superstars they really are! We have had an amazing week enjoying lots of different activities as a whole school. We have learnt to dance in a Zumba class and about personal space and safety with Karate Colin. The children have enjoyed musical theatre and have performed a dance from different films. We have focused on relaxation too through yoga, mindfulnmess and peer massage. The children have learnt about health and fitness, enjoying lots of physical activity and cooking. We have focused on mental health too with art, music and various play sessions to relax both body and mind. We finished our week with a walk around our local area enjoying nature at its best. What a fabulous effort by some of our Year 1 and 2 children at the Shelley Pyramid Cross Country event on Tuesday 12th February. After a fun-packed day of Zumba and Karate, these children still managed to run 1 mile and all come in the top 20 in their races with 148 children taking part in total! All the children received a medal for their efforts, with Meredith Thomas being the 1st girl in the Year 2 race and Charlie Earnshaw being the 3rd boy back. Well done to all of you. We are very proud of the effort and determination you all put in! Shelley College would like to thank all parents and friends who donated at the event to Cancer Research. A team from our federation played in a football competition organised by Huddersfield Town this week. The event took place at Soccer City at Waterloo and was a day long session of games played against other local school teams. A group of 9 girls from classes 2/3 and 4/5 performed their dance routine 'Shake It Off' at the recent Dance Festival hosted by Shelley College. 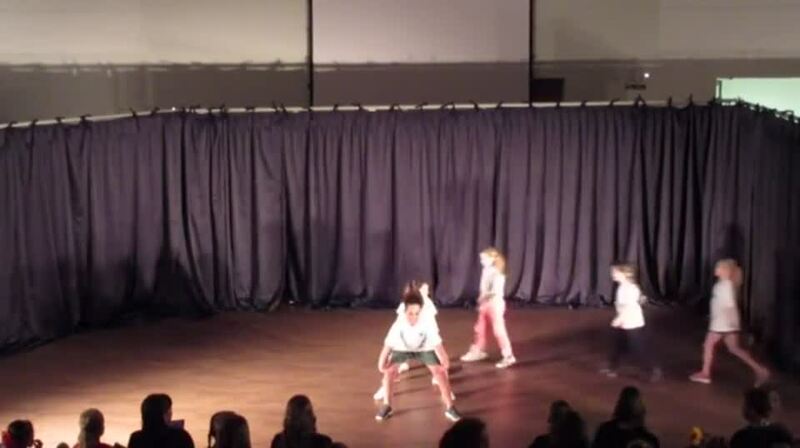 "A brilliant performance by some of our Year 2 and Year 4 girls at the Dance Festival at Shelley College last night. The Year 4s had choreographed the dance themselves and taught it to the rest of the girls during their playtime dance group. A truly brilliant effort! Well done to all involved." A brilliant performance by some of our Year 4/5 children at the School Games KS2 Sports Hall Athletics Competition, achieving 3rd place! We saw brilliant performances by all of our Year 4/5 team at the #School Games Yr 4/5 Cross Country Competition on Tuesday 11th September. Well done to all who took part – you showed true grit and enthusiasm and we are very proud of you. The Year 4 Boys team came 1st and individuals who made it through to the next round, which took place at Newsome High School on Monday 24th September, were Evan R (1st place), Felix E (2nd place), Annabel B (5th place), Marni R (4th place) ** 5th place. There was a huge turnout at the #School games Yr 2/3 Cross Country Competition at Shepley First School on Tuesday 18th September and the Thurstonland team did not disappoint. All the children showed a great deal of enthusiasm and determination and completed very tough courses. Well done to all of the children who took part – we are very proud of you all. What fantastic results from our runners who made it through to the next round of the Cross country championships which were held at Newsome High School on Monday 24th September. All our runners came in the top 10 in all races out of more than 250 runners! Well done again to all of these children. We are very proud of you all. Sam, Felix and Evan have made it through to the Kirklees Final which will take place at Leeds Road playing fields on Tuesday 9th October. We are delighted to announce that we, Thurstonland Endowed (VC) First School, have achieved the Schools Games Gold Mark Award for the 2017/18 academic year. With lots of young people competing in local inter-school competitions this year, we are extremely proud of our pupils for their dedication to all aspects of school sports, including those young volunteers, leaders and officials who made our competitions possible. As part of our application, we were asked to fulfill criteria in the areas of participation, competition, workforce and clubs and we are pleased that the hard work of everyone at our school has been rewarded this year.